Aim: This study was designed to evaluate the efficacy of addition of integrated yoga therapy to therapeutic exercises in osteoarthritis (OA) of knee joints. Materials and Methods: This was a prospective randomized active control trial. A total of t participants with OA of knee joints between 35 and 80 years (yoga, 59.56 ± 9.54 and control, 59.42 ± 10.66) from the outpatient department of Dr. John's Orthopedic Center, Bengaluru, were randomly assigned to receive yoga or physiotherapy exercises after transcutaneous electrical stimulation and ultrasound treatment of the affected knee joints. Both groups practiced supervised intervention (40 min per day) for 2 weeks (6 days per week) with followup for 3 months. The module of integrated yoga consisted of shithilikaranavyayama (loosening and strengthening), asanas, relaxation techniques, pranayama, meditation and didactic lectures on yama, niyama, jnana yoga, bhakti yoga, and karma yoga for a healthy lifestyle change. The control group also had supervised physiotherapy exercises. A total of 118 (yoga) and 117 (control) were available for final analysis. Results: Significant differences were observed within (P < 0.001, Wilcoxon's) and between groups (P < 0.001, Mann-Whitney U-test) on all domains of the Short Form-36 (P < 0.004), with better results in the yoga group than in the control group, both at 15 th day and 90 th day. Conclusion: An integrated approach of yoga therapy is better than therapeutic exercises as an adjunct to transcutaneous electrical stimulation and ultrasound treatment in improving knee disability and quality of life in patients with OA knees. Keywords: Knee disability; osteoarthritis; SF-36; yoga. The management of OA is still far from optimal, because the medications currently available provide limited symptomatic relief and are fraught with a number of side-effect. It is increasingly recognized that a key outcome measure for any health-care intervention for OA is the change in health-related quality of life (QOL). , Although OA itself is not a life-threatening disease, QOL can significantly deteriorate with pain and loss of mobility causing dependence and disability. Health-related QOL may be measured by disease-specific and generic health status questionnaires. Western Ontario and McMaster Universities Osteoarthritis Index Score (WOMAC) is used to measure specific functional disability and SF-36 is used to measure general health status that includes assessment of emotional functioning, energy level, and social functioning in addition to functional disability assessment. Aglamiş et al, Foley et al0, and Diracoglu et al. observed greater increases in the SF-36 after the exercise program of various durations for patients with OA knees. Kirkley et al. showed that in patients assigned to arthroscopic surgery, there was no improvement with health-related QOL. In a study by Tekur et al. the role of yoga in the improvement of QOL of patients with chronic low backache was discussed, and she showed that in the yoga group, there was significant improvement in the scores of WHOQOL (WHO's Quality of life) brief on all domains. In a study by Sudheer et al. about the role of yoga about QOL in normal volunteers, 28% in physical, 16% in psychological, 10.17% in social, and 8.8% in the environmental domain changed significantly after shifting to the control intervention in the second week. There are no studies that have looked at disability and QOL measures in patients with OA knees after integrated yoga therapy involving loosening, strengthening, asanas, etc. Hence, this study was planned with an aim to assess the effects of the integrated approach of yoga therapy on QOL using a generic health-status tool involving SF-36 in patients with OA knee. A total of t patients with OA knees from the outpatient department of Dr John's Orthopedic Center, Bengaluru, were recruited for the study. A sample size of 250 was obtained on G power software by fixing the alpha at 0.05 powered at 0.8 and an effect size of 0.379 considering the mean and SD of an earlier study. A total of t of both genders in the age group of 35-80 years (59.56 ± 8.18) in the yoga group and (59.42 ± 10.66) control group with OA knees (one or both joints) satisfying theAmerican College of Rheumatology (ACR) Guidelines  for diagnosis were included. The inclusion criteria were (i) persistent pain for 3 months prior to recruitment, (ii) moderate-to-severe pain on walking, (iii) Kellegren and Lawrence  radiologic grading of II-IV in X-rays taken within 6 months prior to entry, and (iv) those fully ambulant, literate, and willing to participate in the study. Those with (i) grade I changes in -ray, (ii) acute knee pain, (iii) secondary osteoarthritis due to rheumatoid arthritis, gout, septic arthritis, tuberculosis, tumor, trauma, or hemophilia, and (iv)those with major medical or psychiatric disorders were excluded. The study was approved by the institutional review board (IRB) and ethical committee of SVYASA (Swami Vivekananda Yoga Anusandhana Samsthana) University. Signed informed consent was obtained from all the participants. This was a prospective randomized parallel active control study on patients with OA knees in the age range of 35-80 years. Patients attending the outpatient department of Dr John's Orthopedic Center who satisfied the inclusion criteria were recruited for the study. After the initial screening for selection criteria, they were assigned to either the yoga group or control group. A computer-generated random number table (www.randomization.com) was used for randomization. Numbered envelopes were used to conceal the sequence until the intervention was assigned. Both groups were given the conventional physiotherapy using transcutaneous electrical stimulation and ultrasound for 15 days. Both groups had supervised practices at the center for 40 min daily (6 days/week) after physiotherapy (20 min) for 2 weeks. The yoga classes were conducted in the basement of the hospital where one hall is exclusively dedicated for yoga therapy. The study group was taught integrated yoga and the control group was taught the non-yogic physiotherapy exercises by certified therapists. After this, they were asked to practice daily at home for the next 3 months. Compliance was supervised by telephone calls once in 3 days and a weekly review was conducted once a week for 3 months. The daily review cards were checked for the regularity and doubts if any were clarified. The evaluation was conducted by the senior research fellow. All patients were asked to tick the practices daily after the home practice in the diary provided for the purpose; at every visit their clinical progress and therapy received on the day were documented. All assessments were carried out on 1 st , 15 th , and 90 th days. As this was an interventional study, double blinding was not possible. The answer sheets of the questionnaires were coded and analyzed only after the study was completed. Here, the statistician who did the randomization, data analysts, and the researcher who carried out the assessments were blinded to the treatment status of the subjects. The daily routine practiced at the center in the yoga group included 40 min of integrated yoga therapy practice after 20 min of physiotherapy with transcutaneous electrical stimulation and ultrasound for 2 weeks [Table 1]. The integrated yoga therapy practice included shithilikaranavyayamas (loosening practices), saktivikasaka (strengthening practices) followed by yogasanas and relaxation techniques with devotional songs. Later patients were advised to continue the integrated yoga therapy practice for 40 min at home for the next 10 weeks. Yogic sukshmavyayamas (loosening and strengthening practices): These are safe, rhythmic, repetitive stretching movements synchronized with breathing. These practices mobilize the joints and strengthen the periarticular muscles. Relaxation techniques: Three types of guided relaxation techniques were interspersed between the physical practices of sukshmavyayamas and asanas. Asanas (physical postures): Asanas are featured by effortless maintenance in the final posture by internal awareness. We selected asanas in standing, supine and prone positions that would relax and strengthen the knee joints. Lectures and counseling: Yogic concepts of health and disease, yama, niyama, bhakti yoga, Jnana yoga, and karma yoga were presented in the theory classes. These sessions were aimed at understanding the need for lifestyle change, weight management, and prevent early aging by yogic self-management of psychosocial stresses. The daily routine practiced at the center in the control group included 40 min of therapeutic exercises after 20 min of physiotherapy with transcutaneous electrical stimulation and ultrasound for 2 weeks [Table 2]. These therapeutic exercises included loosening and strengthening practices for all the joints of the upper and lower limbs, brief period of rest, specific knee practices, and supine rest followed by light music. Later patient was advised to continue the therapeutic exercise practice of 40 min at home for the next 12 weeks. 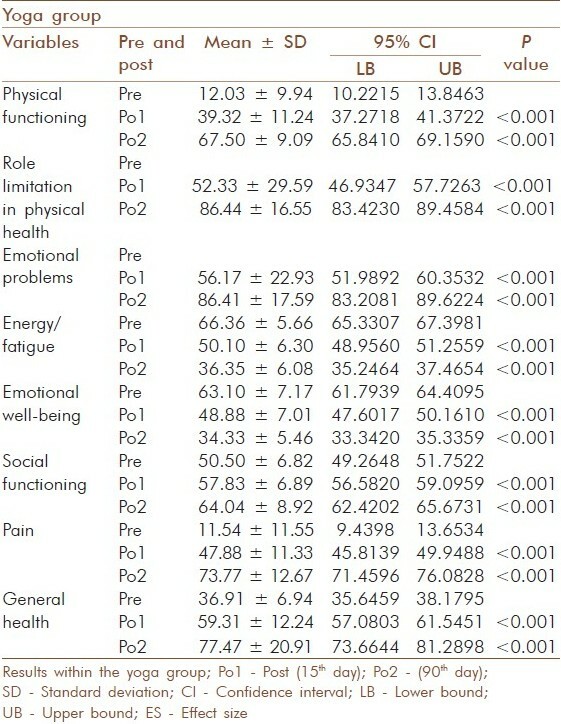 The increase in scores indicates better for domains physical functioning, role of limitations in physical health, role of limitations in emotional problems, social functioning, pain reduction, general health, and for domains fatigue and emotional well-being the decrease in scores indicates better QOL. The internal consistency of the SF-36 Health Survey Questionnaire as determined by Cronbachs was high and ranged from 0.72-0.94. The data were analyzed using SPSS Version 16. The baseline values of the two groups were checked for normal distribution by Shapiro-Wilk's test. Baseline matching was checked by the Mann-Whitney test. Wilcoxon's signed ranks test and MannWhitney U-test were used for assessing 'within' and 'between' groups differences, respectively. [Table 1] and [Table 2] show the interventions of both study and control groups. [Table 3] shows the baseline characteristics which were similar between groups on all variables (P > 0.05, Mann-Whitney test for pre values). The trial profile of the study is shown in [Figure 1]. There were seven dropouts in the study group and eight in the control group. 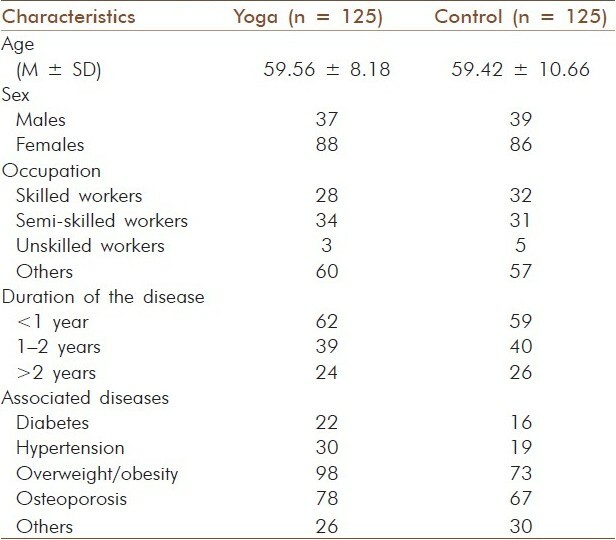 [Table 4] shows the results within the yoga group of 15 th and 90 th day. [Table 5] shows the results within the control group of 15 th and 90 th day, and [Table 6] shows the results between the yoga and control groups. Between and within group differences were highly significant on all domains of the SF-36 (P <</i> 0.001) with better improvement in the yoga group than the control group on 15 th day and 90 th day. This measures all the physical activities including bathing or dressing. In the yoga group, the physical function (P < .001) increased from 12.03 ± 9.94 to 39.32 ± 11.24 and further to 67.50 ± 9.09 and in the control group from 12.82 ± 10.81 to 24.95 ± 13.93 and further to 50.94 ± 14.76 on 15 th day and 90 th days, respectively. This measures problems with work or other daily activities as a result of physical health. The role limitation in physical health (P <</i> 0.001) improved by increase of scores from 52.33 ± 29.59 to 86.44 ± 15.55 in the yoga group and 35.47 ± 36.14 to 58.33 ± 44.52 in the control group on the 15th and 90th days, respectively, with significantly better results in the yoga group than the control group (P = 0.001, Mann-Whitney U test). This evaluates problems with work or other daily activities due to physical and emotional problems. 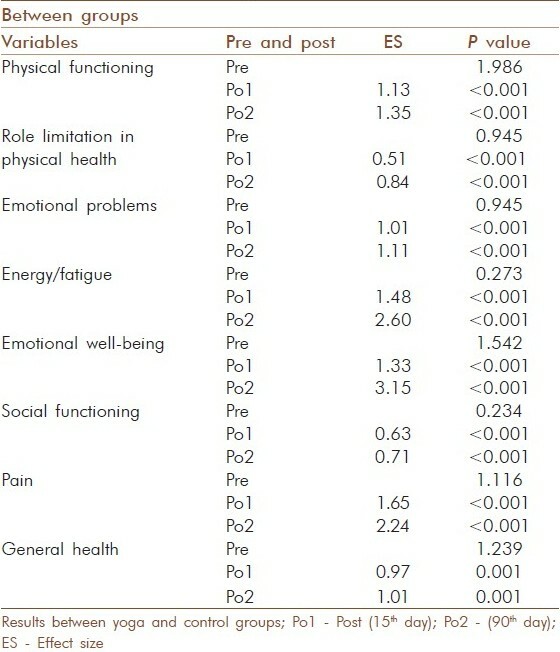 The role limitation due to emotional health (P < .001) improved from 56.17 ± 22.93 to 86.41 ± 17.59 in the yoga group and from 31.02 ± 26.86 to 58.75 ± 38.94 in the control group on the 15th and 90th days, respectively, with significantly better results in the yoga group than the control group (P = 0.001, Mann-Whitney U test). These levels are evaluated by finding out whether a person feels tired and worn out or feels full of pep and energy all the time. The energy and fatigue level improved in both groups (P <. 0001, Wilcoxon's) with reduction of scores from 66.36 ± 5.66 to 50.10 ± 6.30 and further to 36.35 ± 6.08 in the yoga group and from 64.91 ± 5.41 to 58.97 ± 5.6 and to 53.20 ± 6.8 in the control group on 15 th and 90 th days, respectively, with significantly better results in the yoga group than the control group (P = 0.001, Mann-Whitney U test). This evaluates whether a person has problems or no problems with work or other daily activities as a result of emotional problems. In the yoga group, the emotional well-being (P <.001, Wilcoxon's) improved with reduction in scores from 63.10 ± 7.17 to 48.88 ± 7.01 and to 34.33 ± 5.46 and in the control group from 62.46 ± 6.61 to 57.43 ± 5.78 to 52.27 ± 5.91 on the 15 th and 90 th days, respectively, with significantly better results in the yoga group than the control group (P = 0.001, Mann-Whitney U test). This evaluates whether the social activities are limited due to physical and emotional problems. 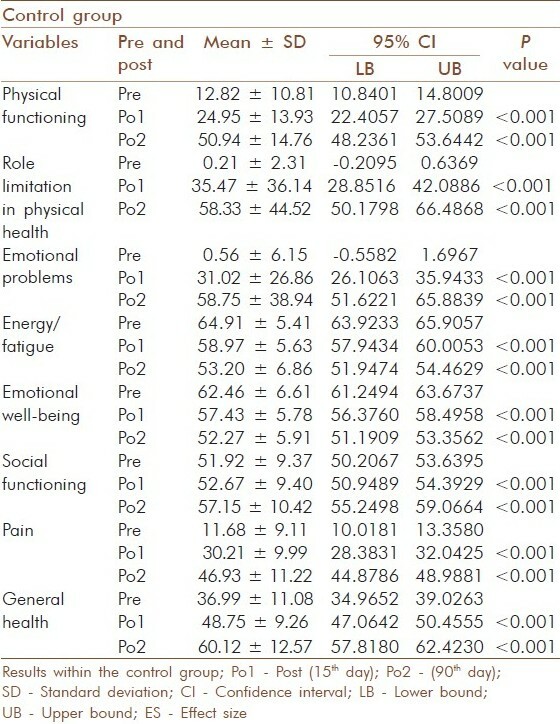 In the yoga group, the emotional well-being (P <.001,Wilcoxon's) increased from 50.50 ± 6.82 to 57.83 ± 6.89 and to 64.04 ± 8.92 and in the control group from 51.92 ± 9.37 to (52.67 ± 9.40) and to 57.15 ± 10.42 on the 15 th and 90 th days, respectively, with significantly better results in the yoga group than the control group (P = 0.001, Mann-Whitney test). This measures the severity of pain that limits the activities. Well-being on scores of pain improved in both groups (P <</i> 0.001, Wilcoxon's) from 11.54 ± 11.55 to 47.88 ± 11.33 and to 73.77 ± 12.67 in the yoga group and in the control group from 11.68 ± 9.11 to 30.21 ± 9.09 and to 46.93 ± 11.22 on the 15 th and 90 th days, respectively, with significantly better results in the yoga group than the control group (P = 0.001, Mann-Whitney test). This evaluates the personal health of the individual. The general health increased in both groups (P <</i> 0.001). It increased from 36.91 ± 6.94 to 59.31 ± 12.24 to 77.47 ± 20.91 in the yoga group from 36.99 ± 11.08 to 48.75 ± 9.26 to 60.12 ± 12.57 in the control group on the 15 th and 90 th days, respectively, with significantly better results in the yoga group than the control group (P = 0.001, Mann-Whitney U test). This randomized two armed parallel control trial on 250 participants included patients of both genders (F = 175) in age 35-80 years with osteoarthritis of knees. Results showed significantly better improvement in the yoga group than the control group on all variables (P < 0.001, Mann-Whitney U test) of SF 36. The reduction in pain observed in our study points to the beneficial effect of yoga as an add-on therapy to conventional physiotherapy practices. In pilot studies on OA knees involving yoga, Kolasinski et al., Ranjita et al0. showed a better reduction of pain in the yoga group than the control group. In our study, we added yoga after the standard physiotherapy and the degree of changes appears to be similar in all the three yoga studies (37-47%). This may point to the efficacy of yoga when used with or without a session of physiotherapy before the practice of yoga. Similar effects of pain reduction ha been observed by Garfinkel et al. in a randomized controlled trial on yoga for carpal tunnel syndrome. Tekur et al. studied the efficacy of the integrated approach of yoga therapy in patients with chronic low back pain and documented 48.8% reduction in Numerical Rating Scale scores in the yoga group. Garfinkel et al. studied the effects of Iyengar yoga in patients with OA hands and found a better reduction in the pain during activity. Yogitha et al. showed a reduction in pain and tenderness in patients with common neck pain after integrated yoga. In a study by Aglamiş et al. there was a significant group differences in all domains of SF-36 ( P <</i> 0.004), while there were no group difference in WOMAC domains (P > 0.004). Baker et al. found increases in the SF-36 physical function, physical role, social and mental health scores and physical performance scores and decreases in the WOMAC pain after a 4-month strength exercise program. Foley et al. stated that after a 6-week exercise program physical performance increased, the WOMAC score did not change, and the physical component of the SF-12 increased after hydrotherapy. Diracoglu et al. observed increases in the SF-36 physical function, physical role, and vitality scores and the WOMAC physical function scores and physical performance in a kinesthetic group is greater than in a strength group after an 8 week exercise program. In a study by Kirkley et al. in patients assigned to arthroscopic surgery there was no improvement with respect to physical function, pain, or health-related than those were assigned to the control group. In a study conducted at our center by Rangaji et al. on the role of IAYT in the treatment of osteoporosis, he showed that in the comparison between the groups, the exercise group showed a significant difference in physical functioning component of SF-36 than the yoga group. This study has revealed a statistically significant improvement in respect of all the domains of the SF 36 score with significantly better improvements in the yoga and control groups. Several factors would have contributed to the beneficial effects observed in both groups in this study. As noted in several earlier studies physiotherapy intervention may increase the blood glow. Better results in the yoga group could be due to its stress reducing effect since yoga is meant to bring about better emotional stability. Yoga is defined as 'samtvam yoga' in Bhagavadgita  which refers to 'the balanced state of mind under any demanding life situation, be physical or psychological (sheetaushnasukhaduhkheshusamah)'. This emotional stability is achieved by the multifactorial approach of yoga that includes safe physical practices (asanas), breathing techniques (pranayama), meditation (dharana and dhyana), and introspective corrections in one's cognitive errors by inputs at intellectual (jnana yoga) and emotional level (bhakti yoga). This may have contributed to better health behavior and improved QOL. Good sample size, randomized control design, active supervised intervention for the control group for the same duration as the experimental group and follow up for 3 months with good compliance (6% dropouts) are the strengths of this study. The result of this study that has shown marked differences between groups on all variables offers strong evidence for incorporating this module of IAYT for knees by the clinicians. A longer follow-up of ≥12 months is necessary to check for long-term efficacy and long-term acceptability. Studies using MRI and biochemical variables may throw light on the mechanisms. Adjunctive program of the integrated approach of yoga therapy for OA knees improves all components of QOL on SF36. IAYT offers a good value addition as a nonpharmacological intervention in improving QOL in patients with OA knees. 1. Chopra A, Patil J, Bilampelly V, Relwani J, Tandle HS. Prevalence of rheumatic disease in rural population in Western India: A WHO-ILAR-COPCORD study. J Assoc Physicians India 2001;49:240-6. 2. Felson DT. An update on the pathogenesis and epidemiology of osteoarthritis. Radiol Clin North Am 2004;42:1-9. 3. Felson DT, Lawrence RC, Dieppe PA, Hirsch R, Helmick CG, Jordan JM,et al. Osteoarthritis: New insights. Part 1: The disease and its risk factors. Ann Intern Med 2000;133:635-46. 4. Lawrence JS, Bremmer JM, Bier F. Osteoarthrosis. Prevalence in the population and relationship between symptoms and x-ray changes. Ann Rheum Dis 1966;25:1-24. 5. Recommendations for the medical management of osteoarthritis of the hip and knee: 2000 update. American College of Rheumatology Subcommittee on Osteoarthritis Guidelines. Arthritis Rheum 2000;43:1905-15. 6. Pendleton A, Arden N, Dougados M, Doherty M, Bannwarth B, Bijlsma JW,et al. EULAR recommendations for the management of osteoarthritis: Report of task force standing committee for International Clinical Studies including Therapeutic Trials (ESCISIT). Ann Rheum Dis 2000;59:936-44. 7. Brazier JE, Harper R, Munro J, Walters SJ, Snaith ML. Generic and condition-specific outcome measures for people with osteoarthritis of the knee. Rheumatology (Oxford) 1999;38:870-7. 8. Patrick DL, Deyo RA. Generic and disease-specific measures in assessing health status and quality of life. Med Care19899;27:217-32. 9. Baker K, McAlindon T. Exercise for knee osteoarthritis. Curr Opin Rheumatol 2000;12:456-63. 10. Maly MR, Costigan PA, Olney SJ. Determinants of self report outcome measures in people with knee osteoarthritis. Arch Phys Med Rehabil 2006;87: 96-104. 11. Aglamiº B, Toraman NF, Yaman H. Change of quality of life due to exercise training in knee osteoarthritis: SF-36 and Womac. J Back Musculoskeletal Rehab 2009;22:43-8. 12. Foley A., Halbert J., Hewitt T., Crotty M. Does hydrotherapy improve strength and physical function in patients with osteoarthritis - a randomized controlled trial comparing a gym based and hydrotherapy based strengthening programme. Ann Rheum Dis 2003;62:1162-7. 13. Diracoglu D, Aydin R, Baskent A, Celik A. Effects of kinesthesia and balance exercises in knee osteoarthritis. J Clin Rheumatol 2005;11:303-10. 14. Kirkley A, Birmingham TB, Litchfield RB, Giffin JR, Willits KR, Wong CJ, et al. A randomized trial of arthroscopic surgery for osteoarthritis of the knee. N Eng J Med 2008;359:1097-107. 15. 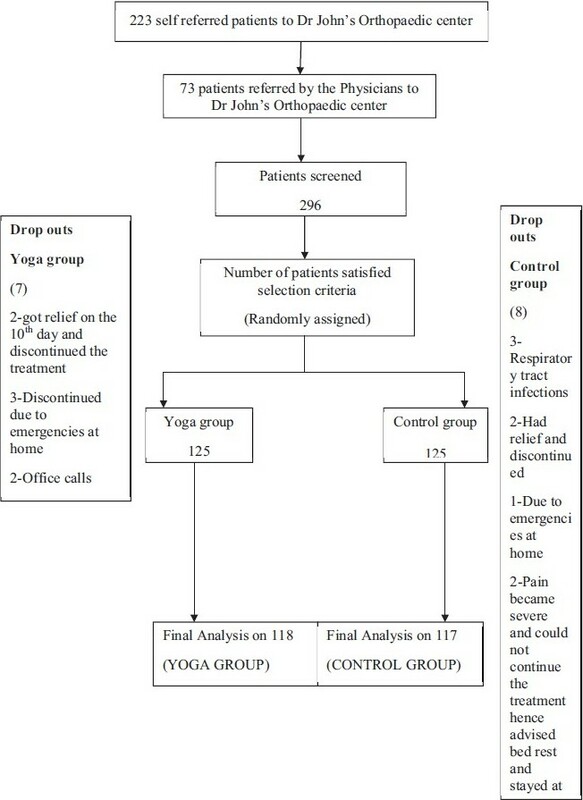 Tekur P, Singhpow C, Nagarathna HR, Raghuram N. Effect of short term intensive yoga program on pain, functional disability, and spinal flexibility in chronic low back pain: A randomized control study. J Altern and Complement Med 2008;14:637-44. 16. Deshpande S, Nagendra HR, Nagarathna R, Sudheer D, Nagendra HR, Nagarathna R. Effect of yoga on gunas (Personality) and health in normal healthy volunteers. Int J Yoga 2008;2:13-21. 17. Bookman AA, Williams KS, Shainhouse JZ. Effect of topical diclofenac solution for relieving symptoms of primary osteoarthritis of the knee: A randomized controlled trial. CMAJ 2004;171:333-8. 18. Altman R, Asch E, Bloch D, Bole G, Borenstein D, Brandt K, et al. Development of criteria for the classification and reporting of osteoarthritis. Classification of the osteoarthritis of the knee. Arthritis Rheum 1986;29:1039-49. 19. Kellgren JH, Lawrence JS. Radiological assessment of osteo-arthrosis. Ann Rheum Dis 1957;16:494-502. 20. Nagarathna R, Nagendra HR. Yoga for promotion of positive health. Bangalore: Swami Vivekananda Yoga Prakashana;2000. 21. Nagarathna R, Nagendra HR. Yoga for Arthritis. Bangalore: Swami Vivekananda Yoga Prakashana;2001. 22. Telles S, Nagarathna R, Nagendra HR. Breathing through a particular nostril can alter metabolism and autonomic activities. Indian J Physiol Pharmacol 1994;38:133-7. 23. Telles S, Nagarathna R, Nagendra HR. Autonomic changes during Om meditation. Indian J Physiol Pharmacol 1995;39:418-20. 24. Ware JE Jr, Sherbourne CD. The MOS 36-item short-form health survey (SF-36): I. Conceptual framework and item selection. Med Care 1992;30:473-83. 25. Jenkinson C, Layte R, Wright L, Coulter A. The U.K. SF-36: An analysis and interpretation manual. Oxford, U.K: Health services research unit, dept of public health and primary care, University of Oxford, 1996. 26. Pipitone N, Scott DL. Magnetic pulse treatment for knee osteoarthritis: a randomised, double-blind, placebo-controlled study. Curr Med Res Opin 2001;17:190-6. 27. Kolasinski SL, Garfinkel M, Tsai AG, Matz W, Van Dyke A, Schumacher HR. Iyengar yoga for treating symptoms of osteoarthritis of the knees: A pilot study. J Altern Complement Med 2005;11:689-93. 28. Ranjita R. Effect of yoga on pain, mobility, gait, and balance in patients with osteoarthritis of the knee. Swami Vivekananda Yoga Anusandhana Samsthana, Bengaluru. Karnataka: 2008. 29. Garfinkel MS, Singhal A, Katz WA,Allan DA, Reshetar R, Schumacher HR Jr. Yoga-based intervention for carpal tunnel syndrome. A randomized trial. JAMA 1998;280:1601-3. 30. Garfinkel MS, Schumacher R, Husain A, Levy M, Reshetar RA. Evaluation of a yoga based regimen for treatment of osteoarthritis of the hands. J Rheumatol 1994;21:2341-3. 31. Yogitha B, Nagarathna R, John E, Nagendra H. Complimentary effect of yogic sound resonance relaxation technique in patients with common neck pain. Int J Yoga 2010;3:18-25. 32. Baker KR, Nelson ME, Felson DT, Layne JE, Sarno R, Roubenoff R. The efficacy of home based progressive strength training in older adults with knee osteoarthritis: A randomized controlled trial. J Rheumatol 2001;28:1655-65. 33. Rangaji. Role of IAYT in the treatment of osteoporosis. Swami Vivekananda Yoga Anusandhana Samsthana, Bengaluru. Karnataka:2010. 34. Goyandaka J. Srimadbhagavadgita tattvavivecani. 19 th ed. Gorakhpur: Gita press publications; 2004. 35. Nagendra HR, Nagarathna R. An integrated approach of yoga therapy for bronchial asthma: a 3-54-month prospective study. J Asthma 1986;23:123-37. Knee disability; osteoarthritis; SF-36; yoga.